Architectural decisions are the key element behind the design process leading to a software architecture. Making software architects aware of the implications of their decisions is only the beginning of what can be achieved by capturing the rationale and the constraints influencing the decision making process in a reusable body of architectural knowledge. In this paper we propose a metric-based approach to the analysis of architectural decision models. Using a hierarchically-structured approach we identify a number of useful goals and stakeholders involved in the architectural design process. Next, we sketch a set of metrics to provide data for the evaluation of the aforementioned goals. 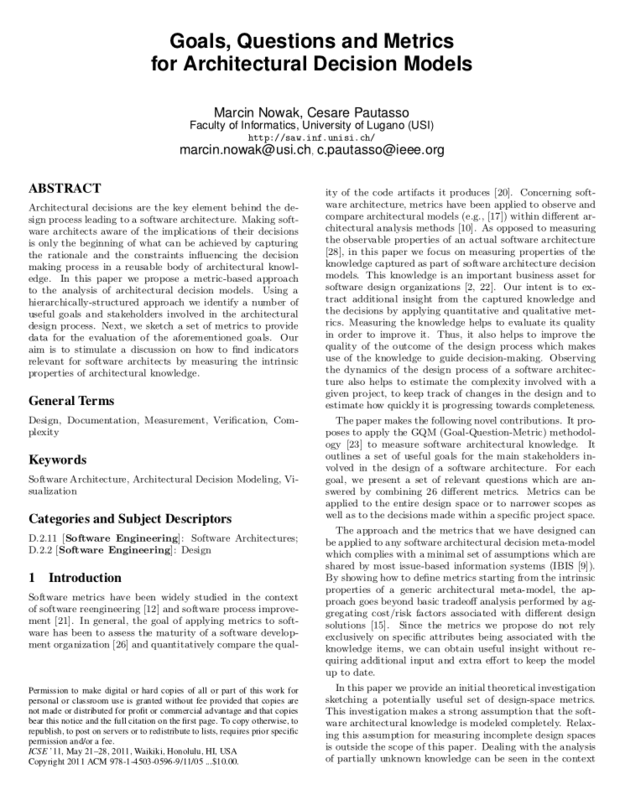 Our aim is to stimulate a discussion on how to find indicators relevant for software architects by measuring the intrinsic properties of architectural knowledge.